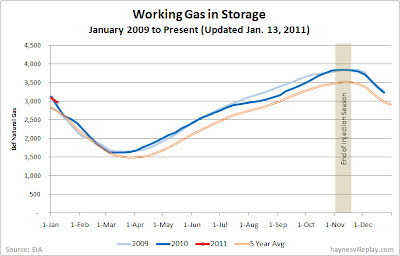 The weekly EIA working gas in storage report showed a 138 Bcf net withdrawal, bringing the total gas in storage to 2.959 Tcf. The weekly withdrawal was considerably lower than last year's figure of 255 Bcf (because of the very cold weather) but above the five year average of 109 Bcf. The current storage level is 69 Bcf (+2.4%) higher than last year and 161 Bcf (+5.8%) higher than the five year average. Temperatures for the week actually were warmer than normal in the Lower 48. Temperatures averaged 34.7 degrees, just 1.3 degrees above normal, and 6.4 degrees above last year's frigid digits. Is a Smackover Rush Coming?? ?